Designs from Teresa England and her husband, Jim, will add beauty to your garden – and the Englands will even set up the pieces for you. Teresa England had been gardening in Dedham for two decades when the deer started invading. England and her husband, Jim, live on a 5-acre lot that has a cedar bog, so she started gathering wood and made a pretty little cedar garden gate that, along with plenty of netting, helped keep the deer out of her vegetables. One thing led to another, and now the Englands have a business called The Woodshaper Shop of Maine, where they use cedar bentwood to create rustic-looking garden gates, arbors (both for the garden and for weddings), trellises, garden fences and planters. The Englands use green cedar because it bends well and lasts longer than other Maine wood. A cedar garden gate will last eight to nine years, England said, while a birch wedding arbor (the birch is harvested from their son’s land) has a life expectancy of five years. She uses the sturdiest wood for the gates and arbors, and fashions the smaller branches into hearts that can be used to decorate a garden gate, hang around the home, or incorporate into a planter. England’s grandchildren – she has four, including triplets who live next door – help her gather the wood and hunt for items that can be used to decorate the garden pieces, everything from goat’s beard and pine cones to antique bottlenecks, colored glass and pieces of china scavenged from old homesteads. The Englands either set up the gates and arbors themselves, or will talk the customer through the process. The baseline price for a garden gate is $50, and the cost goes up from there, depending on the size and design. 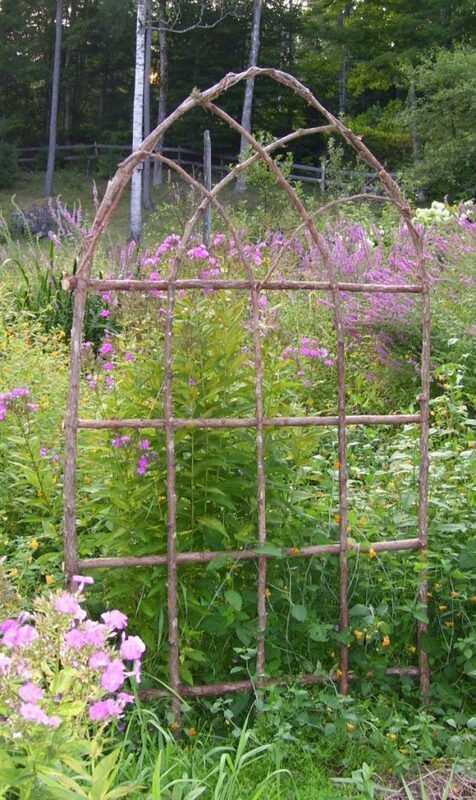 A 3-by-5-foot Gothic trellis costs $40. To see more of the Englands’ work, visit their website, woodshapershopofmaine.com.